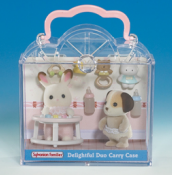 Delightful Duo Baby Carry Cases. A delightful way to transport your Sylvanian babies! These new design double carry cases feature two baby characters and a host of play accessories. This case includes rabbit baby Crème Chocolate & dog baby William Beagle.